This post shows you how to install NextCloud on Ubuntu 16.04 LTS with Apache2, MySQL, and PHP. NextCloud is a fork of OwnCloud. Like DropBox and other cloud storage services, NextCloud and OwnCloud provide similar functions and unlike the others, they both are free to use. This guide will show you how to install and set up Nextcloud on Ubuntu using a single shell script. 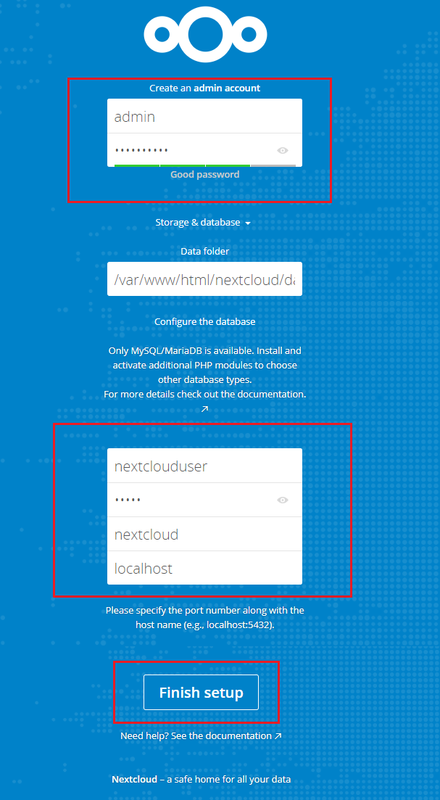 Before Install nextcloud make sure you are properly pointed DNS record with your IP address. Insert Below script in a nextcloud.sh file and save. printf "\n\nInstallation complete.\nNavigate to http://$nextcloud_url in a web browser to complete the setup wizard, before you run the optimization script.\n\n"
Please follow the wizard carefully. After Successfully configure Nextcloud you need to performance tuning and optimize your nextcloud server. For this run below script. # Important: Do not run until the setup wizard in your browser is complete (has initialized the config.php file).